It's been dreadfully hot and humid the past few weeks. Storms yesterday, and a nice peaceful day today in the mid-80s. I've had a good Saturday. Farmer's market early this morning, then some serious decluttering of my home office. Threw out three big bags of trash, and took two big loads to Goodwill. Birdies and I had fresh, sweet corn on the cob for lunch, and I also had tomatoes with cottage cheese. The big news is that I finally found a way to take early retirement! I'll still have to work, of course, but I won't have to worry about being destitute. My last day at that place will be October 8. I'm applying for online instructor jobs and I won't mind working part-time for the university, but I won't ever have to go back to the place that's been driving me crazy for the past three or four years. There's even a good chance I'll be able to get enough peace of mind back to get some writing done. I've been missing Sugar Franklin a lot the past week or so. This time last year she and I were engaged in the mighty battle of cockatiel beak versus syringe. She always won. I was looking for something in the outside storage building the other day, and the first thing I saw was her cage. I didn't clean it very well when I put it out there, so I was thinking today maybe I should just throw it out. In the unlikely event I ever get another bird it will always be her cage. I think I have another cage just like it in another storage area. We don't have any rescues in this area, so there's really no one to give it to. The Bobbsey Twins are just as silly as always, arguing over which perch to sleep on, throwing any poisonous substances such as vegetables out of the food dishes, demanding Nutriberries every night. Charli is well, though I think she's been a bit more quiet lately. More happy to sit on my knee and doze or hang out on the basket in the plant stand after a hard session of chewing up the sudoku book. She's had a few more yellow feathers come in on her legs. Someone on the brown-head list has noticed this on his brown-head as well; he likens it to getting gray hair. 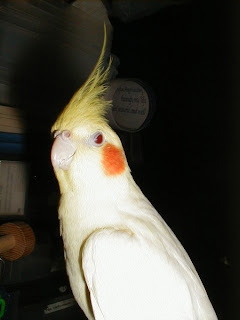 Charli is about 11 now, maybe moving into the beginning of middle age for a brown-headed parrot. I worry sometimes that I give her more attention than I do the Bobbsey Twins, but she demands more while the cockatiels have one another and don't seem to mind if I'm around or not (as long as there are plenty of treats available).